Airlines transport almost half of all travelers to Las Vegas. Efforts and programs are constantly developed to enrich relationships with these valued partners. 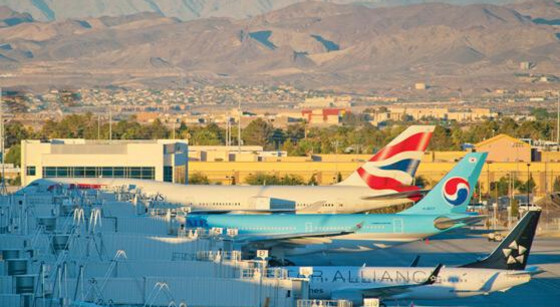 In recent years, the LVCVA and McCarran have been successful in securing major new international air service and increasing domestic market share. New goals for the LVCVA, McCarran and Ailevon Pacific airline consultants include pursuing new nonstop air service and achieving incremental improvements in existing service. The ultimate objective is to increase visitation, hotel occupancy, and average daily rate (ADR). Because attracting new air service is an increasingly competitive process, having the support of local industry is particularly critical. The LVCVA remains committed to aggressively pursuing community and airport marketing programs competitive with those supported in other leading business and leisure destinations. To that end, the LVCVA will expand its outreach and education efforts to its hotel partners on important air service development issues with the goal of increasing understanding of air service dynamics and optimizing the community's marketing resources. We will look for opportunities to host airline conferences that provide exposure and position Las Vegas as the premier destination for leisure and business travel.